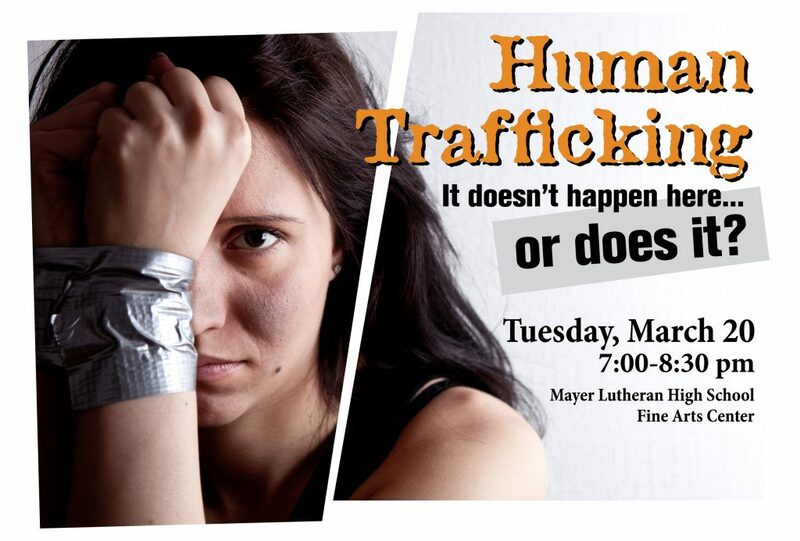 On Tuesday, March 20, 2018 from 7:00-8:30 pm at the Mayer Lutheran Fine Arts Center, Mayer Lutheran High School is partnering with Trafficking Justice West, a faith-based organization combating sexual exploitation in our state, to present an awareness event on human trafficking. Unfortunately, human trafficking is flourishing in cities as well as small communities. Awareness is a key to success in combating this growing industry. Please invite friends, neighbors, and coworkers to this important event. Help us spread the word by downloading the flyer linked below and posting it in your place of business, church, and neighborhood. There is hope. We can change our culture! Click on the poster image to open/download the poster.